Ready To Tackle The Big Wild Challenge? 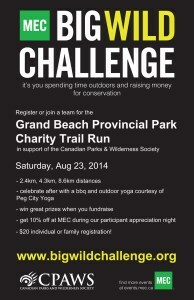 On August 23rd, join the Cana­di­an Parks & Wilder­ness Soci­ety and Moun­tain Equip­ment Co-op for the Big Wild Chal­lenge Char­i­ty Trail Run at Grand Beach Provin­cial Park. The event will see Man­i­to­bans pas­sion­ate about our wilder­ness spaces hit­ting the trails to raise mon­ey for CPAWS, Canada’s pre-emi­nent, com­mu­ni­ty-based voice for pub­lic wilder­ness pro­tec­tion. Choose from 2.5 to 8.5 km routes, win great prizes from MEC when you fundraise and cel­e­brate after­wards with an out­door bbq and yoga class by Peg City Yoga. Walk­ers and new run­ners are also wel­come to join! Ear­ly reg­is­tra­tion is only $20 for an indi­vid­ual or fam­i­ly. It’s all about you spend­ing time out­doors and rais­ing mon­ey for conservation. A Big Wild Chal­lenge is some­thing that push­es your lim­its. It might be an epic trip you’ve been think­ing about for years. It might be a spur-of-the-moment idea, a deci­sion to vis­it a place because it’s beau­ti­ful and nat­ur­al, because it cap­tures your imag­i­na­tion and reminds you why you love to be outside. Remem­ber, it’s some­thing that counts for you. Vis­it www​.big​wild​chal​lenge​.org to sign up for the MEC Big Wild Chal­lenge Char­i­ty Trail Run today!